The links below are a chronological list of Los Cerritos Community News’, Randy Economy, and Brian Hews’ articles from the beginning to present day, range is from early February 2012 to now. The time-line clearly shows LCCN as the leader in breaking news on the Noguez corruption scandal. 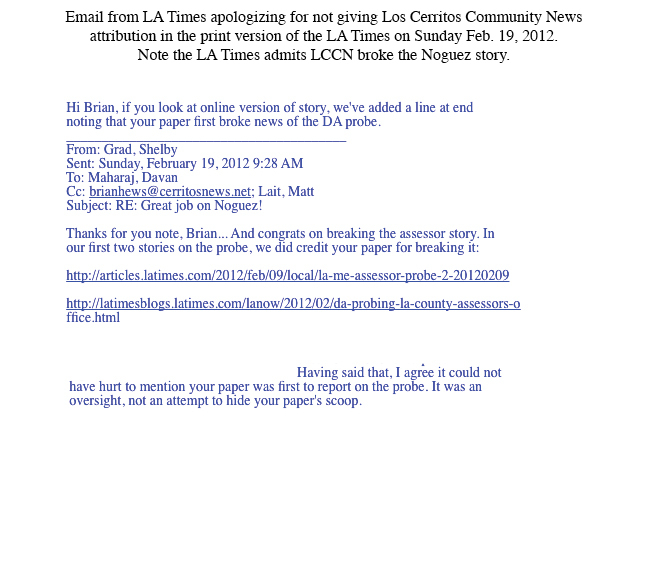 The apology letter below from Shelby Grad of the LA Times gives LCCN credit for breaking the story. During the time between Feb 3 (when LCCN broke the story) and Feb 17, LA Times writers Rueben Vives and Jack Dolan called LCCN several times to ask us “what else we had on the story”. LCCN actually worked with the two writers and gave them the Schenter list of properties. The two writers then published their Feb 17 story without giving LCCN attribution and never gave LCCN attribution thereafter. First newspaper to break story, in print February 3rd, 2012-LA County DA Opens Official Inquiry Into Assessor’s Office. Pay to Play Politics Rampant in LA County Assessor’s Office, in print February 10, 2012. DA Confirms Two Probes on Noguez and Ex-Appraiser, in print February 16, 2012. The next day the LA Times published a story without giving LCCN attribution. The LAT never gave LCCN attribution after that story. LCCN Publisher Brian Hews Calls on Noguez to Resign-First Media Outlet to Make the Call. Assessor’s Office Audit Enters Fourth Month. 92% of Assessor Office Employees Say Noguez Must Resign. Noguez Home Given Historical Designation While In Foreclosure. Huntington Park Taxpayers Could Pay For Noguez Legal Expense. Tax Agent Salari Posts Bail. LA DA Steve Cooley Exclusive Interview With LCCN on Noguez Case. When is Mr. Noguez’s Trial Date and where will he be tried? Who will prosecute at the trail?